You don't need a special occasion to get your bounce on. Give us a call and reserve your spot at our next All-Ages Open Bounce, then come on by and enjoy our awesome inflatables, fantastic games, and wall-to-wall fun. You bring the socks - we'll take care of music, games, and everything else! All children under age 18 must be accompanied by an adult. 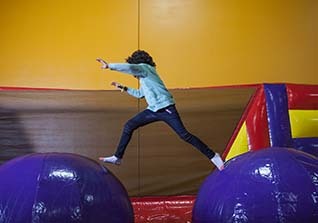 Space is limited and RESERVATIONS ARE REQUIRED for any of our open bounce sessions. Don't forget your socks! 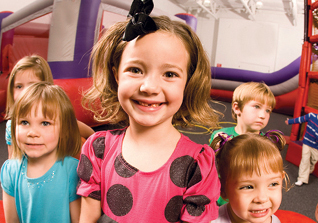 Crank up the excitement at BounceU? 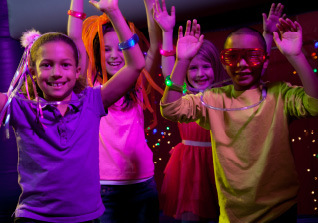 Try our Cosmic Open Bounce with awesome music and out-of-this world lighting. It adds an extra thrill to our inflatable rides and games, and kids love the glow-in-the-dark accessories. 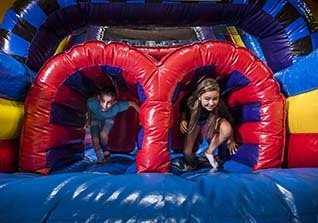 The atmosphere is also perfect for teens and tweens, who especially enjoy this after-dark spin on the BounceU experience. All children under age 18 must be accompanied by an adult. Space is limited and RESERVATIONS ARE REQUIRED for any of our open bounce sessions. Don't forget your socks! Admission includes a Glow Accessory. This is a great event for our BounceU friends AGED SIX AND UNDER ONLY! 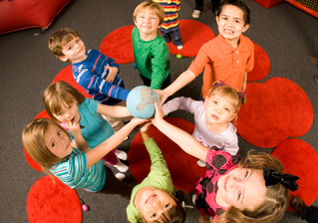 Younger children just can't get enough bouncing, and Preschool Playdate gives them a chance to come back every week. Nothing could be better than having a chance to laugh, socialize, and get a little exercise, and our experienced staff is on hand to supervise at all times. As long as they're old enough to walk, they'll enjoy our music, our games, and all the bouncing they can handle. All children under age 18 must be accompanied by an adult. Space is limited and RESERVATIONS ARE REQUIRED for any of our open bounce sessions. Don't forget your socks! The endless excitement of our inflatables and games is perfect for the whole family, and there's no better place to bond than BounceU. Whether you have two kids or 12, Family Bounce Night is easy, it's affordable, and it's fun for the whole family. All children under age 18 must be accompanied by an adult. Space is limited and reservations are required for any of our open bounce sessions. Don't forget your socks! This program is for children with Sensory Integration Dysfunction, Autism, and other disabilities with a sensory component. These sessions are private and may include siblings of the participants. All children under age 18 must be accompanied by an adult. Space is limited and reservations are required for any of our open bounce sessions. Don't forget your socks!